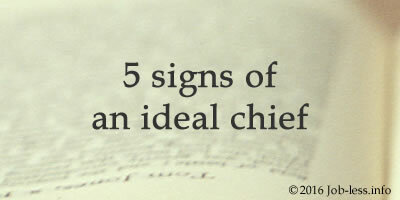 Article #8: 5 signs of an ideal chief. Do you consider that ideal heads don't happen? Then our arguments can convince you of the contrary! The title of "the perfect boss" deserves one who, following these five concepts, organizing the work process. Not everyone can successfully manage a team, no matter how big and professional it wasn't. After analyzing the successful working practice of staff, we have concluded that you are lucky if your boss uses such principles in his work. The conflicts between employees happen always when there are no accurate rules of work, or roles of each team player aren't intelligible. As a result, it is possible to find the aggravated competition and disappointment in collective. And so it is essential to leader to formulate rules of team-working at once. Ideally, if such rules are formed and adjusted by "brainstorming", so the whole staff participates in the arrangement. It's desirable to stipulate not only the work schedule or salary payments, but also the details of internal collaborations, statements, discussions, and the like. Against the background of a careless allocation of roles in any office, there quickly appear dissatisfaction and indignations, such as: "It's not my duty!" When employees realize their duties and responsibilities, which are accepted in the team, then it is simpler to distribute tasks even difficult or unattractive, because the worker is aware of his significance. Succeeding teams also differ in that everyone corresponds to his chosen role. From the very beginning the greeting by name makes relations easier and more trusted. Many chiefs even don't guess that his kindly "Hi! ", and several more of short phrases with praise for any merits, motivates the employee not worse than a bonus. If the age difference is equal to a few decades, such approach is normal accordingly to mutual agreement of the parties. In other cases, possibility to refer to you by name speaks about full mutual trust and reminds that all collective, including the head, works toward a common goal. Teambuilding increases when the boss is interested in employees' opinion. Such form of involvement helps employees to feel a great responsibility; furthermore, can reveal the co-workers in a new fashion, and the changes accepted together will get accustomed much quicker. Shortcomings are part of daily work, and nobody is immune to them. The reasonable chief finds cause-and-effect relationship of employee "delinquency" and, having understood, tries to give a situation to the right decision. The internal culture of interaction in team is also influential at a stage of work on the bugs or professional growth. If your chief in spite of your assurances doesn't merit the "dignity" of the perfect one and does not use the principles given above, try to change your behavior in the relations "chief-subordinate". If your thoughts remain alien for the boss, you always are able to become the perfect one yourself, organizing your own scheme of working cooperation.